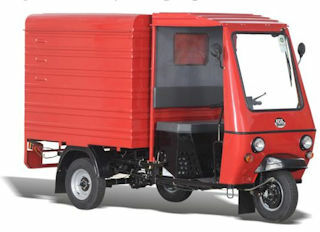 Introduced in India in 2018 the Atul Shakti van is available in either a pick-up version or a delivery van. 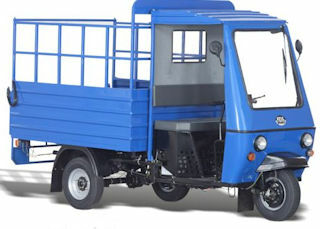 With a rectangular ladder type, high strength tubular chassis and press steel sections the vehicles are powered by a four stroke, air-cooled, 435cc diesel engine. Fitted with handlebar steering and an open cabin with a single bench type seat, the Atul Shakti has 4 forward gears and a reverse. Front suspension consist of a leading link type with double coil springs and shock absorbers whilst the rear has two sets of longitudinal leaf springs with shock absorbers. With a max speed of 30mph (50 kph) the vehicles features a 12 volt lighting system with electronic starting.